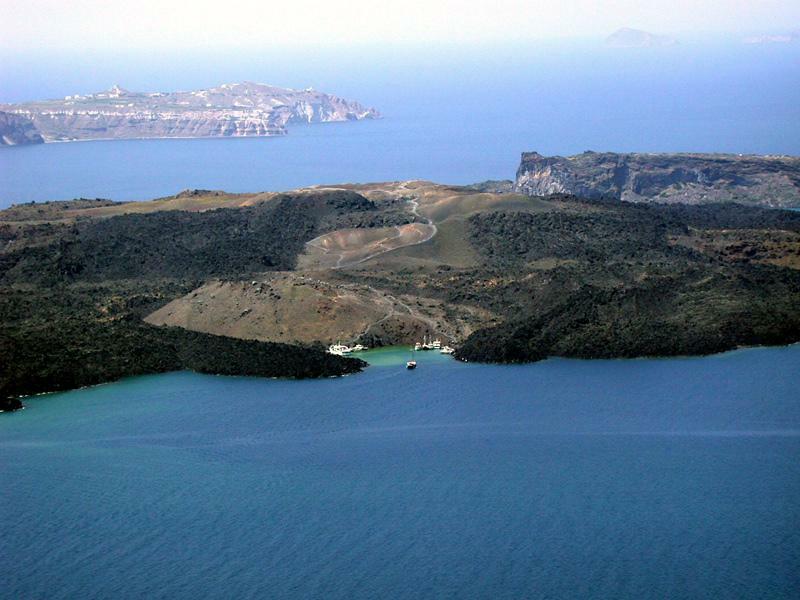 In the flooded caldera of Santorini - a more spectacular sailing area is hardly imaginable - two recently formed islets (Nea Kameni and Palea Kameni) can be seen in the photo above, proof of the ongoing volcanic activity. Since this place is so uniquely beautiful many yacht charters on motor yachts and super yachts are arranged here, and also frequent cruises are made along the surrounding islands in particular, Ios, Amorgos, Naxos and the little islands south of Naxos called the Little Cyclades or Small Cyclades: Koufonisi, Iraklia, Schoinoussa and Donoussa. The motor yachts (motoryachts) will naturally have a wider range of islands to explore than the sailing superyachts and megayachts that will sail “just” 10-14 knots maximum, a speed which the larger motoryachts can easily triple, therefore including even the Dodecanese as far as Patmos, when starting out of Santorini. These luxurious motor and super yachts are usually rented per day and are fully crewed, meaning that not only a skipper or captain but also a (chef) cook, hostesses and several crew will be onboard to pamper the guests. Moreover, the guestrooms or cabins are exceptionally large, all with spacious ensuite private bathrooms. Diving instructors, fitness instructors, physiotherapist etc can be added to the crew or flown in for the day when required as is customary on these motor or super yachts in the Mediterranean, and even more so in Greece and the Cyclades where standards are exceptionally high.